The Zerollo company produced just one fountain pen, but what a pen! The double-nibbed Duo Color is two pens in one. Turning the knob at the end of the barrel extends one nib while retracting the other. Each nib is attached to a semicylindrical carrier that contains a rather small ink sac and a pressure bar. The pen is filled by unscrewing the top of the cap, revealing a peg which is inserted into a hole in the side of the barrel, permitting the pressure bar of the extended nib carrier to be depressed. The pen can be capped with one nib extended in writing position, and in fact the risk of catching the nib tips on the inner cap is rather greater when the nibs are side by side in the semiretracted position. Although many sites state that Zerollo production began in 1932, it appears that the exact date is not known with certainty. An Italian patent was applied for on December 9, 1930 (not digitized as yet, but referenced in the USA patent); a German patent application was filed September 25, 1931 (granted as DE582775), and British, French, and American patent applications were filed on December 9, 1931 (granted as GB397736, FR728038, and US1893130). 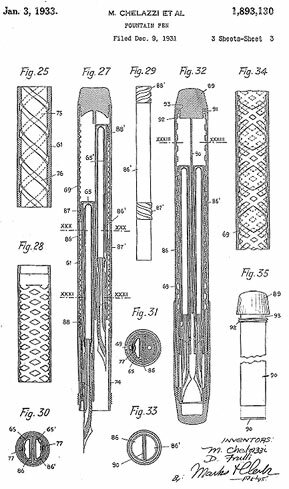 The patent diagrams give some idea of the internal complexity of these pens. It is for good reason that the Zerollo is widely seen as the most complicated pen design ever put into production. Zerollos were sold under license in other countries, as the John Dunhill Twopen in Britain and as the Unic DuoColor in France, but they are rare in any form. Colorful examples are especially scarce and sought after, as are those with metal overlays. A desk pen version was also offered, which is seldom seen.